Twenty-one patients with cluster headaches participated in an open trial to assess the effectiveness of lithium carbonate in the acute treatment and prevention of cluster headaches. Three women and 18 men ranging from 28 to 70 years of age were divided into episodic cluster  and chronic cluster . One patient was in his first cluster. 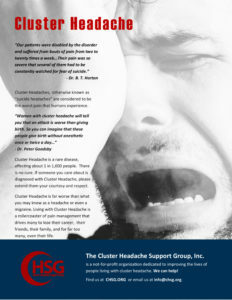 The chronic cluster group was further subdivided into primary chronic (5 patients) and secondary chronic (5 patients). In 11 patients there was absolute improvement, in 5 patients there was partial improvement and in 5 patients there was either no response or the improvement was not sustained. Beneficial results were obtained with dosages lower than those used for effective treatment of bipolar illness. It appears that lithium can be a useful drug in the treatment of cluster headaches provided drug levels and renal function are carefully monitored. No serious side effects were noted.